How do I screen a short film outside the Palais during the festival? 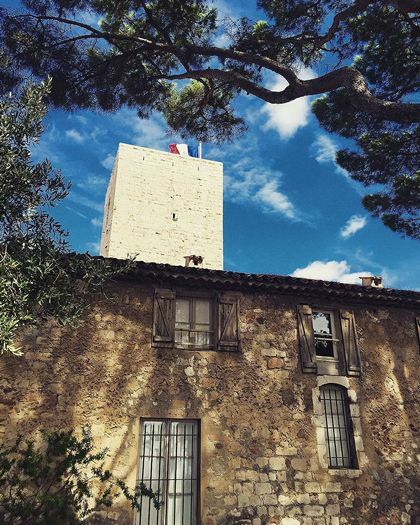 If you visit Cannes for MIPIM, MIDEM, the Festival or anything else, you will sooner or later visit Le Suquet. This is the old quarter of Cannes, which grew around the steep access to the castle on the hill. Now it is probably best known to tourists as the climbing, winding cobbled lane lined with local restaurants, the Rue St Antoine. But keep climbing and you arrive at the castle itself, with its clock tower and church that overlook the Bay of Cannes and Cannes itself. This area is the original fishermans’ residential area of Cannes. The houses are all very old. The streets were laid out at least 400 years ago. It is a 5-minute walk from the beach and is full of restaurants around the Rue Saint Antoine and the Rue du Suquet. A lot of the area is pedestrianised and is a major tourist attraction for visitors to Cannes. 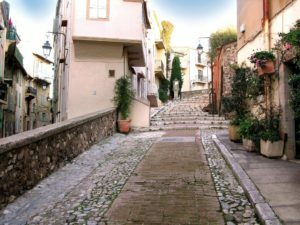 The rue du Suquet is the original main road into Cannes. It came in below the walls of the castle (for defence) and is now a pedestrian street once again with plenty of restaurants. Like all Mediterranean villages, Cannes was originally built on a hill to protect it from major threats of the time, pirates and Saracen. The Suquet, which actually means “hillock” in the old Provençal language, is located to the West of the Bay. Also occasionally called Mont-Chevalier, the promontory rises to 66m. It was the former Canoa to the Ligurians, the Transalpine people who first invested the site. Nothing remains of this occupation. In the middle ages, the monks of the Abbey of Saint-Honorat built a castle as a defence and place of worship. The Chateau consisted of a castrum or fortified village. The site was given to the monks by the counts of Provence. What remains of the medieval castle of the monks of Lérins houses the Museum of the Castre. The site was previously a ceramics factory at the end of the nineteenth century. The Museum contains an important collection of antiquities from around the Mediterranean, donated by the Dutch baron Lycklama. Centerpiece of the Castle, the square Tower overlooks the town. The hardiest will climb the 100 steps to the old Saracen tower to admire the most beautiful panorama over the Bay of Cannes. The Suquet district is pedestrian, the legacy of a medieval setting of steep alleys. The street of the Mont-Chevalier to the place of the Suquet, enjoy a twisting picturesque walk around the Citadel. The atmosphere of the Suquet contrasts with the bustle and glamour of the Croisette. One of the most popular places – and a personal favourite – of the Suquet is the Forville market (photo). The first wooden version of the end of the 19th century gave way in the 1930s to an airy, larger and more modern with an Art Deco feel. 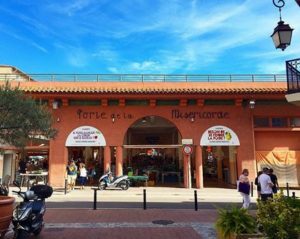 Located at the foot of the Hill of le Suquet, the Forville market has earned a reputation for quality, freshness and variety of its products well beyond the perimeter of Cannes. Below the Suquet, the old Port of which the oldest part, the Quai St-Pierre, dates from 1838 and was recently renovated. In September, this port hosts the sailboats of the Royal Regatta. With its 150 years of existence, the Yacht Club de Cannes is the oldest association of Cannes. Every year in July, the Suquet is steeped in classical music. The musical nights of the Suquet will celebrate their 42nd anniversary in 2017. They offer young talent as artists a stage open-air under the enchanting stone décor of Our Lady of Hope Church. Another event of the district, the Suquet of Arts, a multi-cultural event introduced in August 2014. The programme features painting, sculpture, floral art, theatre and music to live intensely the historic district of Cannes. For a good-value stay in Le Suquet, the Design Appart – a stylish first-floor apartment minutes from everything.